Floor mats for babies are one of the best and most practical “extra” things you can get for your baby. After years of just using a blanket on the floor, I decided to check out what else was available. I’ll share with you the three that I found that I really liked – and which one is my favorite. But first let me share with you why I think these mats are such a great idea. We live in a house with a lot of hardwood floors, which I absolutely love. But….they are not always warm. Picture a beautiful winter day, warm and cozy in the house, and your baby exploring. She is on the floor investigating her toes. You go to pick her up and realize that her little body is cold. Sure enough, even though your house is warm, it is still chilly on the floor, especially if you sit there for any length of time. So you grab a blanket for her to sit on. But a few minutes later you look down to see the blanket all messed up. Even infants have the ability to move around just enough to get the blanket shifting all around. Plus, when you turn her on her stomach, it isn’t very interesting to stare at a blanket! Plus, floors are generally dirty. After all, it is where we walk. So having a barrier between your baby and the floor, carpeted or not, is just a good idea. Finding these specially designed floor mats was just what I needed. Take a look at the three that I liked the best. One thing that I definitely wanted for my baby was something soft. After all, between learning to crawl and walk, there would be plenty of little falls. Foam mats are a great choice. They are both soft and sturdy. I considered a foam mat with alphabet numbers like this one, but after researching further, decided that having letters that come out of the mat would end up with a lot of extra work for me. It would be better for a toddler who can be taught to put the alphabet letters back into the foam mat – but not for an infant. Then I found this foam mat – the Wonderworld Rainbow Foam Wonder Mat. It is great for infants – both soft, sturdy, safe and no extra pieces to worry about. You can see it here. Another thing I considered was whether or not I wanted to leave the activity mat out all the time or whether I wanted to be able to move it around easily, putting it away when not it use. Sometimes we like to spend the day at Grandma’s house and I thought about whether or not I wanted to be able to take a floor mat with me. She has carpet, but carpets can get dirty and babies can pick up a lot of fuzz from carpets. I also wanted to check out options other than foam. I found this little children’s activity mat – the Tiny Love Super Mat – made of cotton and polyester that is perfect. It folds up easily to transport or to store. It is bright and attractive. It has toys attached to it to entertain my baby. It is soft and thick. It washes easy. This tummy time mat came highly recommended so I checked it out also. I like the fact that it doesn’t come apart like the foam one and is more permanent than the cotton one. This one is almost like a small carpet on the floor. It is soft, easy to clean and works great. With designs on both sides, you can change it up for your baby. As they grow, you can teach them the names of things and the letters of the alphabet. 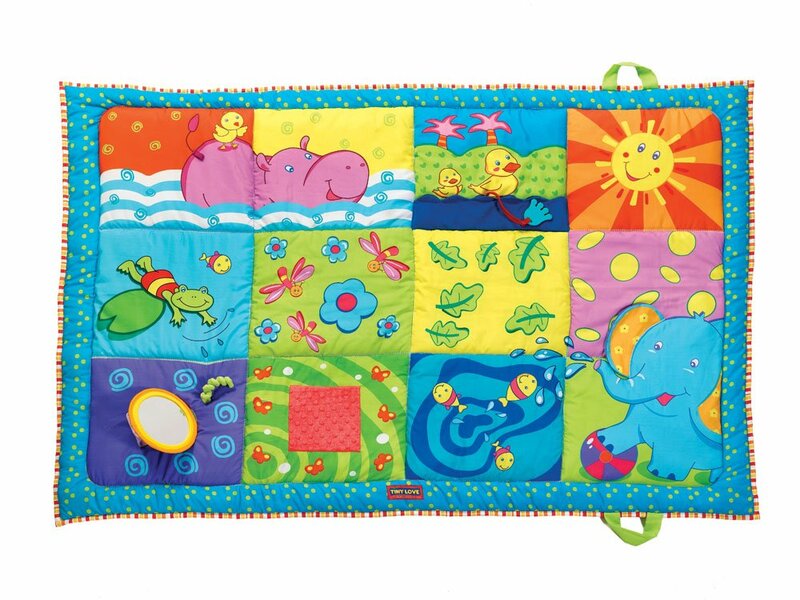 I like the size of this mat too – Personally, this tummy time floor mat is a favorite of mine. 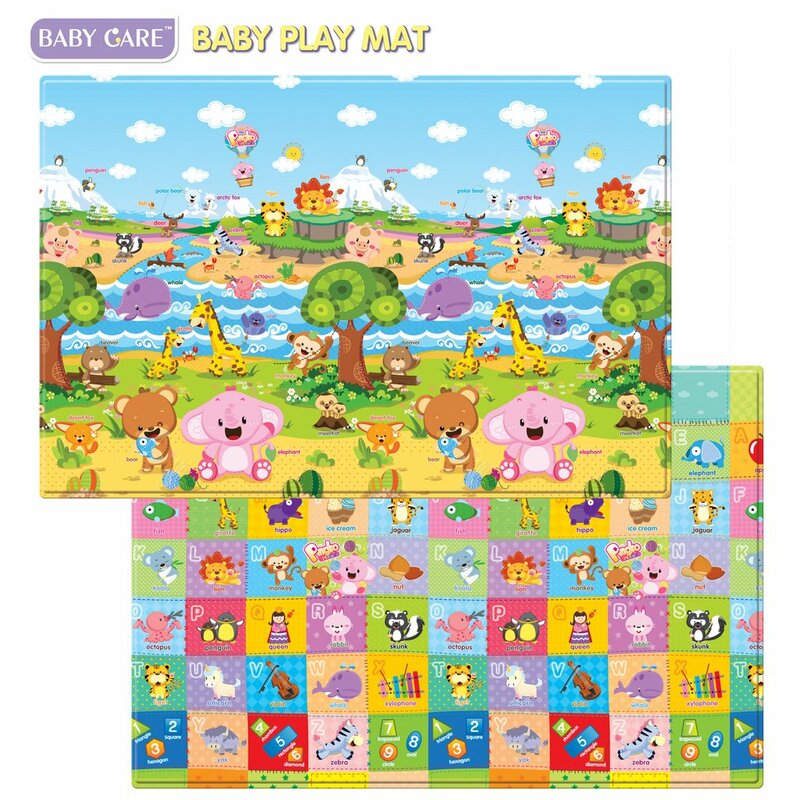 The Baby Care Baby Play Mat has very high ratings and is worth checking out. All three floor mats are great choices. Depending on what you are looking for, you will be really happy with any of these. Check out the links above to learn more about each one!